On Thursday 14 March, Cyclone Idai hit the city of Beira, Mozambique. Please join us in prayer for those affected. Beira suffered high winds, heavy rains and flooding and 90 per cent of the city may have been affected. Hundreds of people have lost their lives. BMS World Mission has made contact with local partners and is in the process of assisting relief responses. Please pray for Mozambique at this time. Debris from the cyclone is piled shoulder-high beside roadways that have been covered by sand blown in by heavy winds. Buildings have lost their roofs, and trees are uprooted. Flooding from burst riverbanks and heavy rain pose a threat to the safety of survivors. The outbreak of waterborne diseases is a concern, due to the disruption of water supplies, as is the lack of shelter, food and clothing. Cases of cholera and diarrhoea continue to rise. President Filipe Nyusi announced that search and rescue operations to find survivors from the cyclone had come to an end. As of 30 March 2019 it has been reported that 501 people died as a result of the cyclone. Devastation is extensive, with around 100,000 houses identified by the authorities as having been destroyed. Efforts are now concentrated on rebuilding infrastructure and helping those affected. Beira was at the centre of the devastation caused by Cyclone Idai. 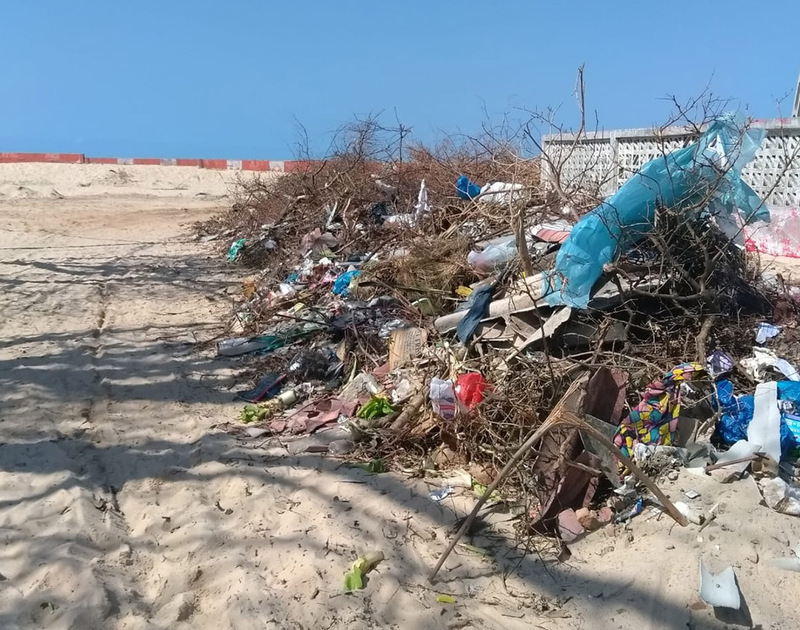 Debris from Cyclone Idai is piled shoulder-high, and roadways are covered in sand. BMS is assessing the best way to assist in the aftermath of Cyclone Idai. 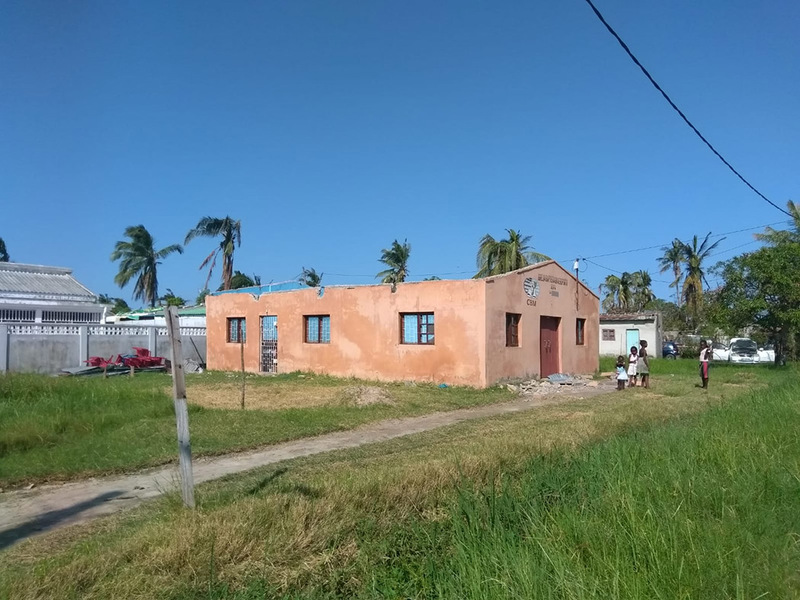 “We are supporting the Baptist Convention of Mozambique (CBM)’s relief response by strengthening capacity support and lending our help to its relief programme,” says Rachel Conway-Doel, BMS Relief Facilitator. BMS will continue to consult with CBM on how British Christians can best support the Mozambican Church in its response. Thank you for all your generous giving and faithful prayers as we do so. “We were getting messages from a friend saying that her windows had broken. Water was coming into the lounge and kitchen and she was worried. We also got a message from a friend who thought that the roofing on her daughter’s bedroom had come off,” says Liz Vilela in her latest blog post, describing the cyclone. Trees were uprooted by strong winds. 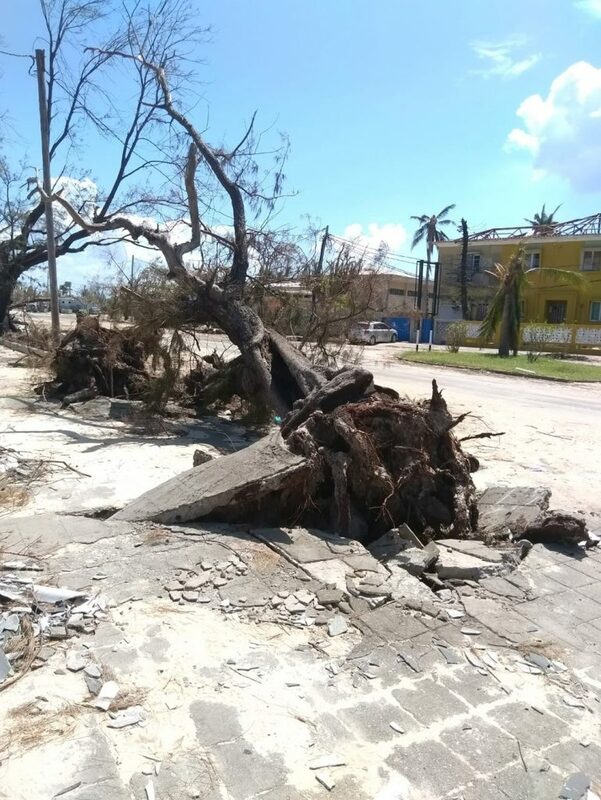 Carlos Tique Jone is in Beira assessing damage to buildings. “I praise the Lord that I am alive,” he told BMS. Jane Edwards has flown into Maputo instead of home to Beira. Sergio and Liz Vilela are safe. Sergio has returned to Beira to assist relief efforts. Annet and Damien Ttendo-Miller are currently in Uganda. Mark, Susanna, and Lizzie Barrell are at their home in Maputo. Liz and Sergio Vilela's church is the Igreja Baptista do Aeropuerto in Beira. It lost its roof and suffered damages in the storm. Pray for all those in Beira, including BMS World Mission worker Carlos Tique Jone and his family. Pray that those who need help would receive it soon and that God would use his people to bring relief and help even now. Pray for those who have lost family members and homes. Pray that God would bring them the help they need and that we who have not been affected can find ways to be useful and merciful to them. Pray for God to strengthen those helping and comfort those traumatised. Pray for all BMS mission personnel and local workers, that they will be safe and be used by God in the lives of their community at this very difficult time. Pray for the relief response following this tragedy. Pray that Beira will recover quickly. Pray for a compassionate, sustainable and God-inspired response from the international community, including our community of churches. Thank you for your love for Mozambique. Please keep praying for the people of Beira and for our partners there. If you would like to do something more, you can help our Mozambican partners on the ground with relief and recovery work by giving now. Christian Lawyers are speaking up for the poor and oppressed in Mozambique. In a small church, with an orange sand floor and iron-sheeted walls, the attention of 25 people is focused unwaveringly on a tall woman in her mid-fifties. An experienced Mozambican lawyer, speaking to them in their own language about their rights. One minute everyone is roaring with laughter, the next they’re silent. Lidia commands respect. She’s teaching them about gender based violence. About what Scripture says. What the law says. Giving them biblical keys to unlock answers. Is it okay to beat your partner? No. Is it okay to force a teenager to marry? No. People are answering. Nodding. Understanding. Some of them are visibly moved. After the session, which lasts all morning, nine people come forward to ask Lidia questions. That’s Saturday, and on Tuesday morning two people arrive at the Christian lawyers’ office in Maputo to get advice about the family issues and domestic violence they’re experiencing. They’ve discovered that help exists. The BMS-supported legal team in Beira. This is what the Association of Mozambican Christian Lawyers (AMAC) is all about. Teaching people the law. Speaking up for the poor and needy. Defending the abused and oppressed. Christian lawyers coming together, in one of the least developed countries in the world, to share God’s heart for justice and see the vulnerable realise their rights. Through your gifts, prayers and support, BMS World Mission has been walking with AMAC every step of the way. The association was born, in part, out of our legal work in Uganda with the Ugandan Christian Lawyers’ Fraternity; and over the last six years, we’ve seen AMAC grow from a dream into an established organisation educating churches, schools and communities on their rights and providing legal aid for some of the country’s most marginalised people. A small number of Christian lawyers – from Mozambique, Uganda and the UK – are demonstrating that the law is good, that much of it comes from the Bible, and that it’s for everyone. They’re gathering members and momentum. And they’re just getting started. The challenges facing many Mozambicans are huge and varied, so the BMS-supported justice league has a lot of work to do. For the poor and vulnerable here, the law is literally a foreign language. It is written in Portuguese and almost 50 per cent of the population, like many in the church Lidia was visiting, don’t speak it fluently. An added problem is that the laws, although good, are relatively new (with Mozambique only obtaining independence in 1975, and then suffering through civil war from 1977 to 1992) so they have not had long to become established. Widespread poverty and a lack of opportunity mean that countless people are suffering injustices without even knowing there are laws in place to protect them. The justice system is simply inaccessible. “People with no money believe that there is no justice in the world,” says Gervasio, a BMS-supported lawyer in Beira. Our team is working to show them that’s not true. Legal education saved Aida* from a loveless, forced marriage. She was 16 when her parents demanded she marry a 40-year-old man or face a severe beating. Her sister, a preschool teacher, attended an AMAC legal education session and had one of her friends ask about child marriage. AMAC explained that it is illegal in Mozambique for anyone under the age of 18 to get married, and it is also illegal to beat a child. Equipped with this knowledge, a group from the training went with Aida’s sister to her parents’ house and confronted them, explaining what they had learnt about the law. The parents confessed they hadn’t known it was wrong. Luis Generoso, Executive Director of AMAC. They were sorry and relented. That was a year ago. Now, Aida is living with her sister and is part of a church. She is free from fear of violence and forced marriage, and is thankful to the Christians who helped her. “A lot of change can be made through education,” says Kathy, a lawyer who has just finished four years of service with BMS in Mozambique. Not all injustice is obvious. 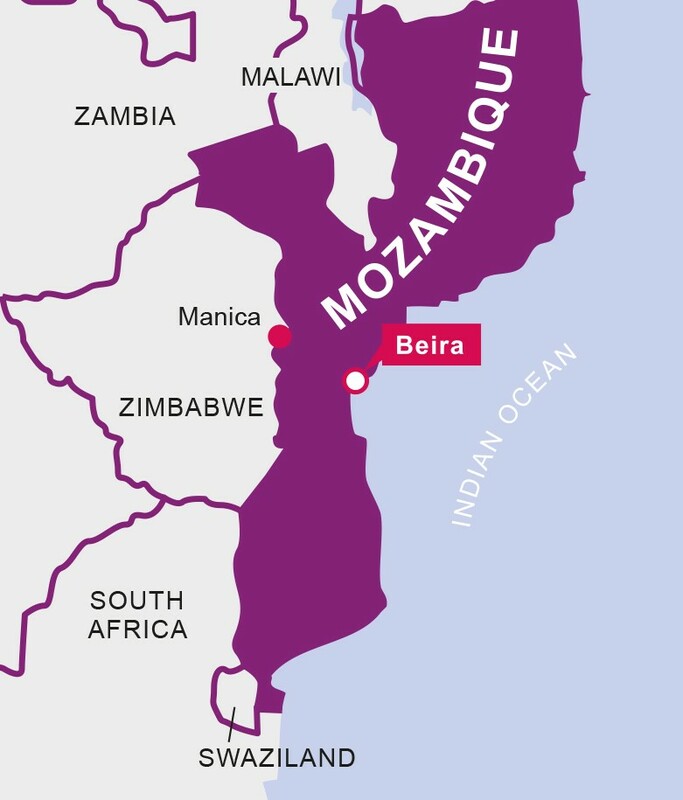 Working in churches and communities, the BMS-supported legal teams based in Beira and Maputo regularly meet people who are unregistered citizens or who believe they are married when legally they are not. These legal misunderstanding can have big ramifications. By explaining simply how to register a baby (or in many cases an adult) or get married legally, AMAC is helping people learn when they are outside of the law and what to do about it. On the outskirts of Beira, eight couples recently got married. Through AMAC training, these men and women discovered they weren’t legally husbands and wives. Now they have the protection marriage can bring – the women will no longer lose their homes and security as well as their partners if their husbands die. It’s all very biblical. Disputes over land. Widows and orphans. All our legal education is focused on empowering the most vulnerable in society. AMAC runs sessions with rural, untrained pastors and with city street boys; with teenagers in schools and with preschool teachers working with disadvantaged children. Our lawyers have even started working with a deaf church, where the congregation struggles to understand or be understood by the community and is very vulnerable to abuse and injustice. As well as teaching people about their rights, BMS-supported legal workers are advocating for the voiceless. We’re representing imprisoned street children to see that they get a fair trial and don’t remain in custody indefinitely. We’re helping single mothers to receive the child maintenance they’re entitled to. And we’re supporting survivors of domestic and sexual violence. Tiago* sits on a pew in First Baptist Church in Beira and quietly tells a story. A grown man raped his 12-year-old niece. It took nearly four years to get the culprit convicted. The man got two years for his crime – impersonating a police officer to scare a child into following him to an isolated place, sexually assaulting her and then running away. He is appealing his sentence. The AMAC team has been walking alongside Tiago’s niece since he brought the case to them. No-one is happy with the outcome, but Tiago has hope that some justice will be done. “Without doubt, AMAC should continue,” he says. And Mozambican lawyers are doing just that. But they need your support. There aren’t many lawyers here, let alone Christian lawyers willing to give up the lucrative career they’ve studied hard for to pursue justice for the vulnerable. Annet, BMS legal team leader in Mozambique. And yet those who have captured the vision are holding fast to AMAC’s mandate: “Learn to do right; seek justice. Defend the oppressed. Take up the cause of the fatherless; plead the case of the widow” (Isaiah 1: 17). Your gifts, your prayers and your partnership are vital. “Without BMS support, maybe we can’t survive,” says Luis Generoso, AMAC’s Executive Director and one of its founding members. And it’s so important that AMAC survives, and thrives. Antonio, Kathy, Leonardo and Lidia, four members of the AMAC team in Maputo, changing lives through the law. In a small church, with an orange sand floor and iron-sheeted walls, the attention of 25 people is focused unwaveringly on a tall woman in her mid-fifties. She’s telling them about their rights. Telling them that the Bible and the law say that they have value. She’s handing them a set of keys. Giving them a way to unlock some of the doors they’ve been trapped behind. She’s opening their minds. And the knowledge she is giving them is setting captives free. This article appears in the new issue of Engage, the BMS magazine. Subscribe today by hitting the button on the right to read more about how your gifts are transforming lives around the world. Real people are suffering injustices and abuse every day in Mozambique. We want to stop this, and you really can help us. Invest in our justice mission in Africa. Commit to regularly praying for and giving to the work you have just read about by becoming a BMS 24:7 Justice Partner. For more information click here or phone 01235 517628.